“The Map” is one of only three areas a business can market themselves and is Google’s answer to the ancient phone book. 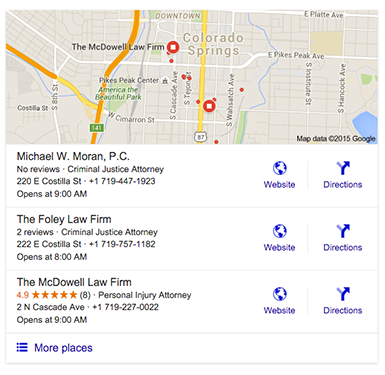 It places 7 local businesses relevant to the users search directly next to a map of the local area. There are only 7 spots available per page. This is laser precision marketing. The user is looking for you! If you’re not on the first page you are nowhere. For business owners, this is the place to be and the place to be seen. Until now it took several months if not years to get your web-site to the front page of Google. The only other option was sponsored links which can cost as much as $140.00 per click. 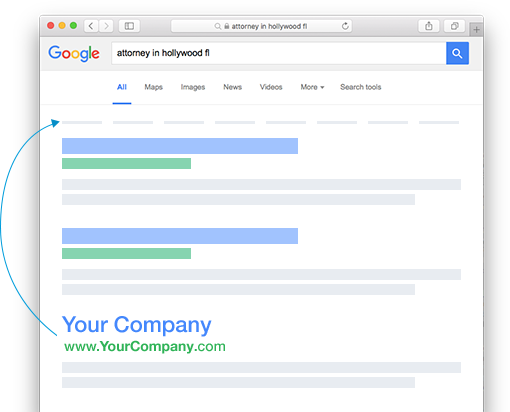 We guarantee that your business listing, phone number, and website will be on the front page of Google for the term of your service. 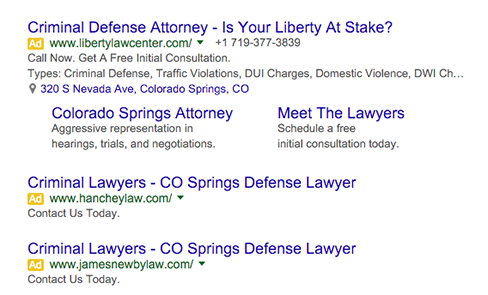 You can now have your companies name, phone number and web-site placed on the FRONT page of GOOGLE in just a couple weeks. This is where we are going to place your business. 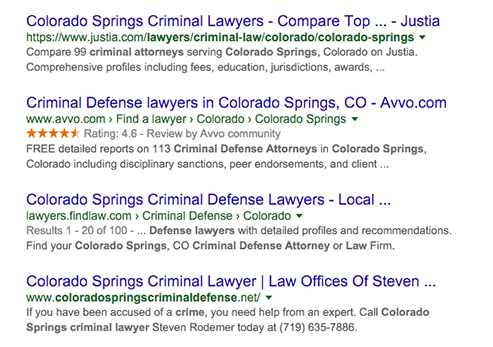 You will see the results for Criminal Lawyer Colorado Springs directly to the right of the local business listings “THE MAP” at the top of the front page. Each of the 7 businesses have their name, phone number, and link to their website posted here if they have one. These are the websites found below the local business listings “Maps”. In order for your web-site to rank on the first few pages of Google or any search engine, a full search engine optimization (SEO) campaign must be developed. This is a timely and costly process. We have put over 400 business’ “thYnking” in the past 12 months. Here is what we do to put you “thYnking”. Working directly with Google, we formally register the search phrases we have agreed upon as well as all the information you can place under the More button you see at the end of your listing. Once we register your business with Google you will receive a 4 digit PIN. You will receive an automated call from Google to confirm the info we have submitted is for your business. We work with you to select 5 or more search phrases that you want to appear for and which will provide you with the most visibility by users. Our team of internet marketing consultants use the most advanced tools to ensure the use of keyword phrases that are searched most often. We keep your business listed on the front page of Google Local Maps for the period of your service agreement 24 hours a day, 7 days a week or your money back. Twice per month we check your Google Local ranking to assure you have the placement we have guaranteed in writing. We provide you with monthly reports which show how many times your listing appeared on the front page of Google and how many people clicked on your listing. We are incentivized to keep you in the top 7 – or we lose you as a client! We select one type of business within one city/area and then move on.